There are two types of bomberos in Chile. Can you tell them apart? The first type of bombero is the Chilean firefighter. These brave souls are an all-volunteer army of firefighters spread across the country. The fact that they are not paid is amazing to me. Back home we had mostly full-time firefighters paid for by local taxes. Volunteer firefighters were most common outside of cities in smaller towns or in the country. 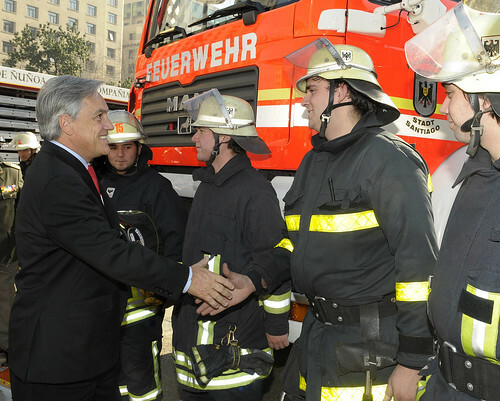 Chile has volunteer firefighters in big cities and small ones. If you haven’t had them come help you, you’ve probably seen them fundraising on a busy street corner. After all, they do need to raise money to fund their operations. In Chile, the bomberos hold a special place in everyone’s heart. I’ve never heard something bad spoken of a them and they are universally trusted. When you visit a fueling station in Chile, you’ll encounter the second type of Chilean bombero. This bombero is the attendant that puts gas in your car. Like their firefighting brethren, these bomberos wear uniforms and are generally very helpful. You’ll see them at every gas station, and just like the firefighters, they’d appreciate a tip. So while these two types of bombero are very different, they share some similarities. Typically when talking about them, the context of the discussion will let you know which person is being referenced. What is your favorite story about a Chilean bombero? Just got back from first visit to Chile. Had no idea I was supposed to tip gas station attendant! I feel bad now. But I did give to a bombero who was soliciting in the middle of the street in San Clemente in the Maule.